Smt. Ranjani and Gayatri are some of the most sought after and popular Carnatic musicians today. The sisters gave a vocal concert hosted by CAMAGA (the Carnatic Music Association of Georgia) at the Hindu Temple of Atlanta on April 5, 2014. Ranjani and Gayatri began their music career as violin duet artistes even before they reached their teens. Then they started giving vocal concerts in 1997 and, within barely three years, have won high praise from critics and music lovers all over the globe. The sisters have the special distinction of being A-Graded in violin as well as vocal. They have received several prestigious awards such as the Kalki Memorial Award and the National Eminence Award given by the Shanmukhananda Sabha, Mumbai, in the year 2004. A close-up of HN Bhaskar (right) from The Hindu. 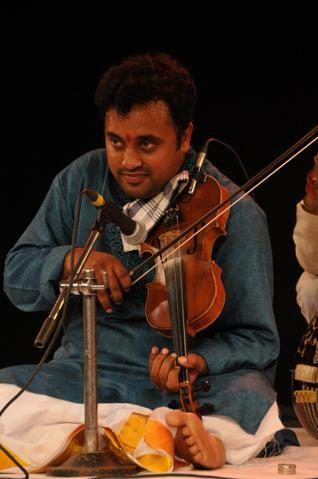 H N Bhaskar is also a prominent violinist in the Carnatic music field. He gave his first public performance at the age of eight. 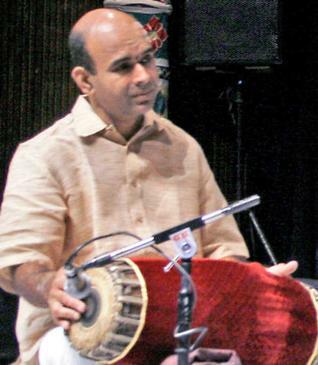 He has accompanied all the senior musicians in the Carnatic music field and has released his own albums. A recipient of an award from the Sangeet Natak Akademi, he has performed in Carnegie Hall and around the world. Manoj Siva, a professional mridangist, is well sought after by senior musicians in the Carnatic music field. He has been accompanying artists from a very young age and he has accompanied many of the stalwarts of the Carnatic music in concerts all over the world. Madras was always their home, say Carnatic violinists and vocalists Ranjani and Gayatri. In a disarming interview, they talk about music, Mumbai, their Palakkad accent, and why they can't imagine living anywhere else but in Madras. R. Ragu of The Hindu keeps the camera running.